“We start this presentation in Dundee and see Strathtay Routemasters operating on a variety of routes, one of the popular routes being the 73 to the Ninewells Hospital. Whilst in Dundee we also see Tayside Volvo Ailsa B55 no. 46 in the fleet turned out in a representation of the Dundee Corporation green livery in recognition of the octo-centenary held in 1991. Once in Perth a visit to Mill Street garage revealed several coaches with registrations from the Routemasters. A Leyland Royal Tiger Doyen with registration WLT 427 whilst another Leyland Tiger bore that from RM42. Hidden away from the public's view were several buses still in London Transport red being used to provide spares. The main route for the Routemasters is the 5/5A from Perth City Centre to North Muriton and from here we take a ride on one of them and on the way pass a police roadblock. Again Mill Street garage finds RM45 awaiting the fitment of blinds prior to entering service and another RM has a set of experimental blinds fitted, these being colour coded for different routes. The early evening run in sees buses fuelled before being parked up for the night. Liveries of two versions of the French blue, orange and white are seen as well as the red and white of Perth City Transport. Stagecoach used Leyland Nationals branded as ‘Perth Panther’, but it wasn't long before they too used Routemasters, …if you can’t beat them, join them! 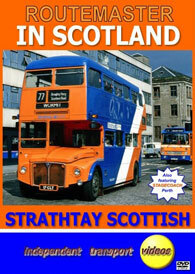 Strathtay learner buses in the form of Bristol LDs and FLFs are also featured. RM943 was loaned to Northern General and alongside RM1109 were tested to see if crew operation was the answer for busy routes. One may remember that Northern General had a fleet of forward entrance Routemasters including RMF1254. As no further Routemaster buses were bought after the trial, it can be assumed that the trial wasn't a big success! A visit to the Stagecoach garage in Perth reveals a variety of buses. From here we go to Spittlefield, used as a Stagecoach outstation but once the home of A & C McLennan. An RMA leaves the garage whilst a McLennan bodied Leyland PS1 arrives for maintenance”. …So take your seat and enjoy this nostalgic video presentation featuring the iconic Routemaster running in service many miles away from its natural home in London! Duration : 93 minutes (approx).